May’s deal to leave the European Union (EU) sells our country short. We shall no longer have a say on many EU rules which will still bind us. We shall still have to pay, but have no say. That’s not taking back control, that’s losing it. The integrity of the United Kingdom is under threat. 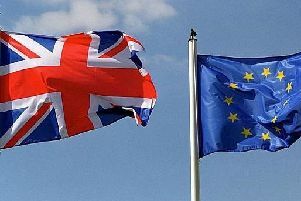 The EU will have a great say over Northern Ireland’s trade and economic arrangements. Scotland is now demanding similar access to our major EU export market. The deal will make us poorer and less powerful. Businesses are already leaving the UK, meaning less tax money will be available to pay for the NHS, housing and social benefits. Isolated, it is harder to make our voice heard in the world. May’s deal takes away our right to live, work, study and export as freely in 27 rich countries. It does not end uncertainty for 1.5million British expats living in the EU. This lousy deal leaves us effectively stranded in an airport departure lounge without knowing which flight we shall be taking. According to a mid-November Sky poll, only 14 per cent support May’s Brexit deal. If that’s what we feel, why should our MPs vote for May’s deal against our will? The alternative to rejecting the deal is not a no-deal Brexit. It is a People’s Vote. There is no majority in Parliament for a no-deal Brexit. In light of the growing difficulties we have experienced in the past three years, it may be that staying in the EU is not so bad after all. Even Boris Johnson recognises that.